Be a part of the Doo Dah Parade! McGinty’s Gallery at the End of the World, 2475 N. Lake Ave., Altadena will again sponsor the outgoing queen float for the 33rd Occasional Pasadena Doo Dah Parade on May 1. It will honor 32nd Queen Skittles in a manner befitting her personality and reign. Artist Dave Lovejoy will head the project, as he did last year, as float designer, creating the concept and leading volunteers in bringing it to fruition. 32nd Queen Mickie will be serving as his assistant. The gallery is seeking volunteers to help make the float, as well as donations of materials to create it. In return, you will be invited to march with the entry down the brand new parade route in East Pasadena on the big day. Lovejoy is planning to incorporate as many repurposed materials as possible into the float. The gallery is especially in need of large pieces of cardboard, such as refrigerator boxes, television boxes and bicycle boxes. Smaller boxes will also be appreciated. Also needed is paint, decorative ribbons, rickrack and other notions and items that will make the float sparkle. Volunteers will be needed to craft the materials into shapes and decorate them accordingly at the gallery noon-5 p.m. April 10, 17 and 24. You are encouraged to bring a large box for yourself to decorate, along with any notions you would like to use. You do not need any special talents or artistic ability to help with the float~ we will teach you and find something that you can do and have fun too! First call for Doo Dah float fun! Have you yearned to be a Doo Dah insider, but haven’t found an opportunity? Here’s your chance! 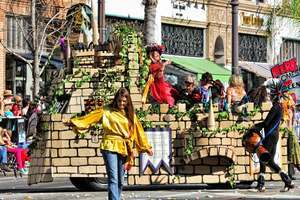 McGinty’s Gallery at the End of the World in Altadena will again sponsor the outgoing queen float for the 33rd Occasional Pasadena Doo Dah Parade on May 1. It will honor 32nd Queen Skittles in a manner befitting her personality and reign. Artist Dave Lovejoy will head the project, as he did last year, as float designer, creating the concept and leading volunteers in bringing it to fruition. I wil be serving as his assistant. Here’s where you come in. We need donations of materials, time and talent and in return, you will be welcome to march with our entry down the brand spanking new route in East Pasadena on the big day. We are planning to use as many repurposed materials as possible. We are especially in need of large pieces of cardboard, such as refrigerator boxes, television boxes, bicycle boxes, etc. We can also use paint, decorative ribbons, rickrack and other notions and items that will make the float sparkle. Please watch my blog for more information as to when you may drop off materials and times for float creating/decorating. You do not need any special talents or artistic ability to help with the float~ we’ll find something that you can do and will have fun doing too! Last year was a blast! Come join us at the biggest party in Pasadena! SATURDAY, MARCH 13TH, 6:00pm to 9:00pm. Students of ROOM 13, an international network of student-operated art studios will show work at The Judson Studios Gallery as part of NELA Art Night. Three ROOM 13 studios, including James Foshay Learning Center in South Los Angeles, Eliot Middle School in Altadena, and Marjorie Street in South Bay, will showcase paintings, drawings, sculptures, mixed media, assemblage, mural art and animation at this collaborative art installation. The Judson Studios, an internationally known stained glass maker run by five generations of family members, was also the first home to the USC School of Fine Arts until 1920. In 2008, Light Bringer Project, a nonprofit arts provider, engaged with the program’s international trustees and decided to take advantage of this opportunity for our own public school children. Partnering with Project Design Studio, the organization launched the first ROOM 13 in America at James Foshay Learning Center in South Los Angeles. They proceeded to found ROOM 13 at Eliot Middle School in Altadena. The third, and most recent model, ROOM 13 at Marjorie Street, was formed early this year in the South Bay vicinity. Like its peers, each creative studio operates as a physical space flourishing within a public school or community setting and is solely managed by the students. ROOM 13 is dedicated to proving the worth of the individual with with the support and mentorship of school staff and community members. Facilitated by an artist-in-residence, also from the community, students work in teams, as partners or alone, determining the scope and content of their own creative projects. ROOM 13 artists also learn self-reliance by designing a business model that will sustain their own studio operation. TBWA\Chiat\Day advertising has also provided support of the ROOM 13 network through the contributed help of its creative professionals. will benefit ROOM 13 studios. I’ll be dusting off my swords for the Friday soiree at McGinty’s Gallery at the End of the World in Altadena. So if you’d like a slice of art, music, dance and cool culture, c’mon down and find out what Royalty does on their day off.